Ottawa city council agreed to provide an additional two toilets in the hub stations of Hurdman and Bayview on Phase One of the Confederation line and to do the same for hub stations in the next phases. There are at least 17 downtown public toilets in public buildings (National Gallery, NAC, City Hall, Archives, Supreme Court, Library, etc.) displayed on the maps produced by Ottawa Tourism; some with security guards. There are zerostreet level signs. Ottawa Gatineau has 10 million visitors every year – how do they easily find a public toilet? Apparently led by Starbucks and followed by BridgeHead, Tim Hortons and others, coffee shops and similar are increasingly making their toilets somewhat more available. That’s not to say that everybody is comfortable asking for a code or key (or will readily be given one). There are zero public toilets on a sidewalk. Meanwhile, Montreal is building 12 public toilets along pedestrian high traffic sidewalks. At any one time, about half the approximately 200 toilets listed by the City are closed. (Flushing InequalityResearch by Carleton U students in 2016). There are 108 splash pads and dozens of sports fields, not all of them have toilet access. City council approved an additional ten porta-potties for summer 2018. These each cost $5 a day, which includes cleaning twice a week. Washrooms in some older buildings make inadequate provision for wheelchairs or require users to enter by a back door. 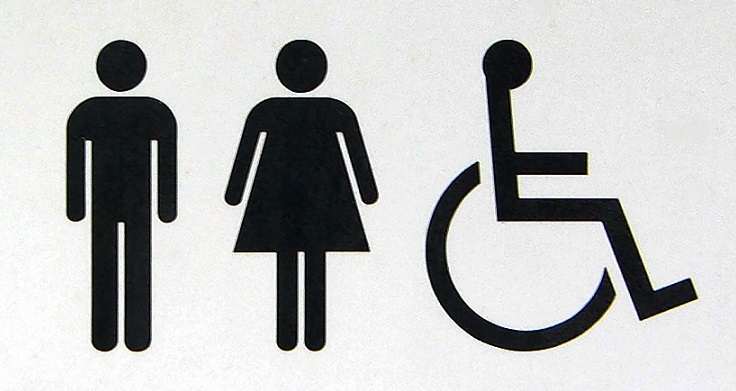 Washrooms do not provide for transgendered people who risk harassment using their preferred toilet. People living on the street must urinate and defecate in doorways and alleys when the public toilets are closed. Require the space of a stall and more time to adjust their clothing, manage feminine hygiene and empty their bladders. Yet many buildings continue to provide the same area washrooms for both men and women. The new toilets in NAC are an exception. Malls and other public buildings use the same or similar characters for both elevators and washrooms. It would be less confusing to use the ‘holding it in’ graphic below. We loved the toilet sign at the new Ottawa Art Gallery, which uses an outline of a toilet seat and water closet, and is also in braille. In July, GottaGo was invited by the Ottawa Citizento be an ‘armchair mayor’ for a day and make the case for a low cost change that would make Ottawa a better city. We used that space to advocate for more street level signs showing directions to public toilets in downtown. In November, GottaGo was featured at the Ottawa launch of ‘No Place to Go – How Public Toilets Fail Our Private Needs’by Lezlie Lowe; a wide-ranging discussion of public toilets in Canada, the USA and elsewhere, published by Coach House Books. We welcome the fact that web pages and apps such as ottpee.ca, Flush, GoHere, Quench and ToiletFinder are available for those with smart phones and who know these tools exist. The last times we checked there were still lots of gaps for Ottawa. Some progress made on the LRT and welcome progress by many coffee shops. Small advances with porta-potties. Many outstanding needs for more signs, more sidewalk public toilets, and more porta-potties at sports fields and park-and-ride locations. We give Ottawa a ‘C’– the city needs to try harder and commit more resources. We are looking to the new City Council to take the need for public toilets more seriously. This entry was posted in Uncategorized on November 15, 2018 by gottagocampaign.